The next planetary encounter on our tour brings us to the domain of the ice giants. These planets differ from the gas giants because they are composed primarily of frozen water, ammonia, and methane rather than hydrogen and helium. Here we find a large, blue planet with little or no surface features. It shines like a blue green gem in the heavens. 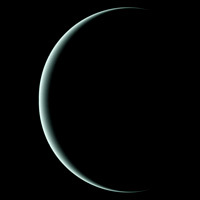 This is the planet Uranus, and it is the seventh planet from the Sun. 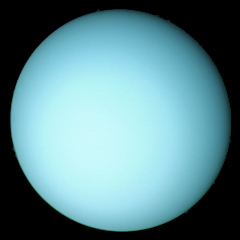 Uranus was named after the god of the heavens in Greek mythology. According to myth, Uranus was the son and mate of Gaia the father of Cronus (Saturn) and of the Cyclopes and Titans. 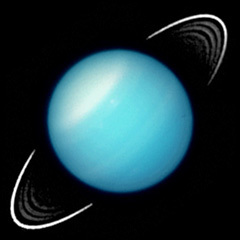 The planet Uranus was the first planet to be discovered in modern times. The British astronomer Sir William Herschel found it with his telescope in 1781. Before this, it had been assumed to be a star. Herschel also discovered Uranus' two largest moons, Oberon and Titania. We now know of 27 moons in orbit around Uranus. They represent a wide range of sizes and shapes. Uranus has only been visited by one spacecraft. This was the extended Voyager 2 mission. That encounter took place on January 24, 1986. Nearly everything we know about Uranus was learned at this time. 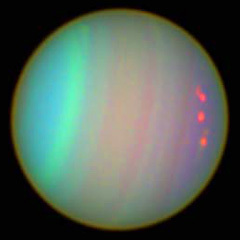 Uranus is different from any other planet in the Solar System in that its axis of rotation is tilted 98 degrees. It is nearly parallel to the ecliptic. 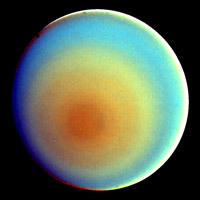 Uranus appears to be tipped on its side. This has some interesting effects on the planet. The Sun shines alternately on the poles and equatorial regions of the planet rather than constantly shining on its equatorial regions, as on Earth. Astronomers are not sure what accounts for this strange position. One theory suggests that a massive collision with another planet-sized body may have knocked Uranus on its side. This collision is believed to have taken place very early in the Solar System's history. Another strange fact about Uranus is that its magnetic field is tilted at a 60-degree angle to its axis of rotation. This angle is only 12 degrees on Earth. An interesting effect of Uranus' sideways tilt is that the tail of the planet's magnetic field is twisted like a corkscrew. When Voyager 2 arrived at Uranus, astronomers were expecting to find complex cloud structures similar to those on Jupiter and Saturn. But when the images finally arrived, nothing was visible but a featureless blue-green sphere. False-color images of the planet later showed that banded structures of clouds were present but were extremely faint. They are partially obscured by the overlying layer of methane. Uranus is the third of the gas giants from the Sun. It is believed to be composed of about 83% hydrogen, 15% helium, 2% methane, and trace amounts of acetylene and other hydrocarbons. It is the methane in the planet's upper atmosphere that gives it a blue-green color. This is because the methane absorbs red light. High winds in the middle latitudes of Uranus blow in the direction of the planet's rotation at up to 360 miles (580 km) per hour. Studies have shown somewhat slower winds blowing in the opposite direction at the planet's equator. Astronomers once thought that beneath these layers of clouds was a massive ocean of super-pressurized liquid ammonia and water. But data sent back from Voyager 2 seem to indicate that this is probably not the case. The internal structure of Uranus is probably very similar to that of Jupiter and Saturn, but without the rocky core and liquid metallic hydrogen center. Instead, there is probably a less-dense collection of rocky material at the core. 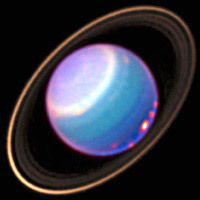 In 1977, Earth-based astronomers discovered that Uranus, like all of the other gas giant planets, has a system of rings. A total of nine rings were identified from Earth. When Voyager 2 visited Uranus in 1986, two more rings were discovered. Two of Uranus' moons, Cordelia and Ophelia, act as shepherding moons for one of the rings. Voyager 2 also discovered that Uranus has a magnetic field. It is tilted 60 degrees from the planet's rotational axis, and is about the same intensity as the magnetic field on Earth. The magnetic field on Earth and the other terrestrial planets is probably caused by electrical currents produced in the planets' molten core. Since Uranus has no molten core, astronomers are not sure what is responsible for creating the magnetic field.